Camp Counselor Training is now online. Please remember, youth are required to take six (6) hours of training to be a camp counselor. 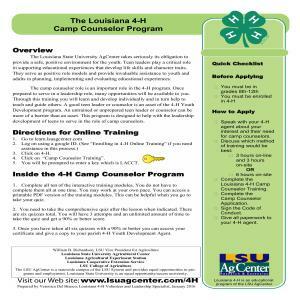 Only three (3) hours are offered online, so youth must complete an additional three (3) hour face-to-face training with their 4-H agent. Please follow the directions below to complete the training process by accessing our online training system. This new system allows volunteers to complete the training at their own convenience. The training can either be viewed as interactive training modules or printed out in a pdf version. Once a youth volunteer has completed the modules, they will then have to take a quiz and complete it with a 90% or better score. They will have unlimited time to take the quiz, and 3 attempts to make a 90% or better. Be aware, that questions do come from the lecture portion of the training, not just the slides. If you have any questions at any point in the process, please contact the 4-H office.